Four lead guards made the Big Sky first-team this season, and not coincidentally, the teams for those guards are the ones still standing as we enter the semifinals of the Big Sky tournament. Let's take a look at each of them, and what makes them so good. Cliff Colimon (Eastern Washington) - We knew before the year that Colimon was going to get big minutes, but I'm not sure anyone predicted he would be this good for the Eagles. He has been better in all categories this year, most notably bumping his scoring (10.4 PPG to 15.9 PPG), and assists (1.8 APG and 17.8 ARate last year, 5.0 APG and 31.6 ARate this year). He is still not the most efficient scorer (shoots just 39%), but he has become of the best playmakers in the conference. He has been a great senior leader for Eastern Washington, and they rely on him a lot to take care of the ball and make good decisions. Charles Odum (Portland State) - Odum is second in the conference in scoring, and like the leader (Lillard), he does it with great efficiency. He increased his scoring from 14 PPG to 19 PPG this year. He is a master at getting into the lane, and either getting a great look on a nice runner, or getting to the free throw line. He shoots over 61% on 2-pointers and 84% from the line, and is able to keep defenses honest from behind the arc (34%). His true shooting percentage is 20th in America, and he sports a 119.1 ORtg. He is a fun guy to watch, because even though he is a great scorer, he doesn't force things on offense. Will Cherry (Montana) - He is the defensive player of the year in the Big Sky, and is the rare player that changes the game as much (more more) on the defensive end as he does on the offensive side of the ball. You can tell how hard he has worked on his games by his shooting percentages... his freshman year he was 6/35 from 3-point land, last year he shot 22.5%, and this year he is up to 38.4%. He is on pace to become the conference's all-time leader in steals, and will likely enter next season as the POY favorite. 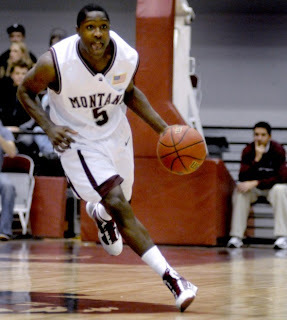 He has also shown a killer instinct this year, which is a big reason why Montana is so tough to beat. Damian Lillard (Weber State) - I have written a lot about him obviously this year, but he has been sensational all year long, despite being in the spotlight nationally (as he led the country in scoring for much of the year) and from NBA scouts coming to most of the Wildcats games. I wrote extensively about his attributes here, but in short, he is a great and efficient offensive player, can hurt you in a variety of ways, gets teammates involved, and takes great care of the basketball. He has topped 40 points twice this year, and 30 points eight times. I have a feeling he has some good stuff up his sleeve for us the rest of the tournament. Anything I missed about these guys?